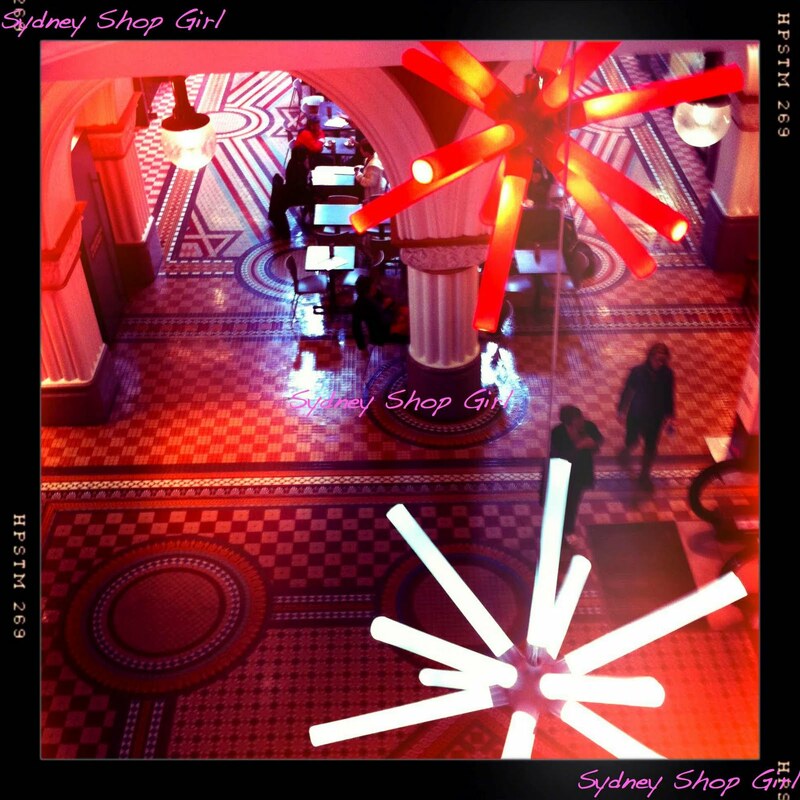 Sydney Shop Girl: The Allure of Lights and Italian Waiters. Cutting and Pasting. The Allure of Lights and Italian Waiters. Cutting and Pasting. Two of the 'blossoms' from the Blossoms installation. The artist Warren Langley took his inspiration for this piece from eucalyptus flowers 'falling'. The light added an almost eerie glow to shoppers walking under the lights in what was actually broad daylight on an average Saturday morning. The QVB is looking particularly vivacious at the moment. There is a light installation near the central stair case called Blossoms. It is part of this year's Vivid Sydney Festival. My favourite thing about Vivid is the creative use of light as art. In past years, I've braved the cold to see what Vivid has done to the sails of the Opera House but I haven't yet gotten around to it this year. I think the festival is on until after the long weekend so perhaps next weekend will be my chance. But I digress and apologize for using this post to plan my proposed social activities for the coming week. The retreating feet of an Italian waiter at Vanto after he presented me with my 'morning coffee'. I was so taken I didn't pay enough attention to the glass cabinet of pastries to the right in this photo. 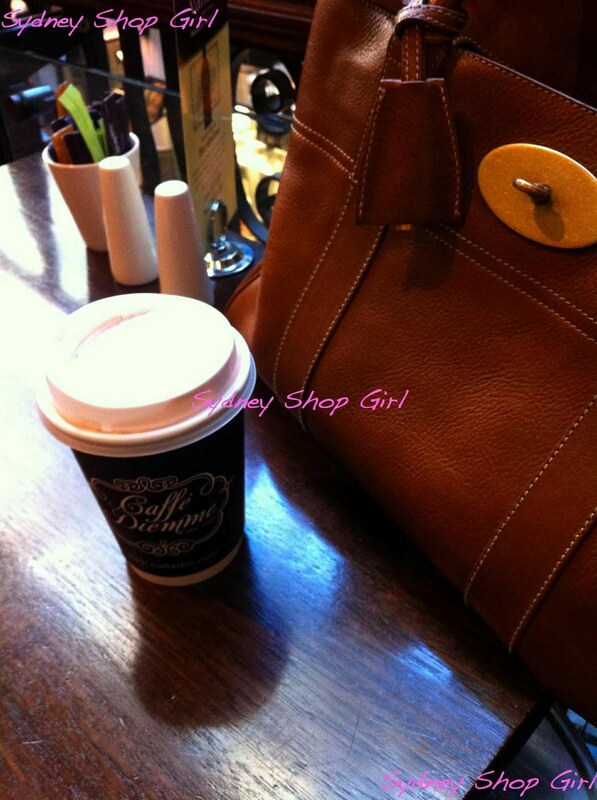 It would have been a bit creepy if I were to sit down at a table with my (excellent) takeaway mocha solely for the purpose of listening to phrases of Italian and Italian accented English, wouldn't it? 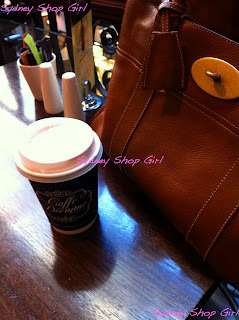 I took my coffee and went about my business. I think I need to have a sit down brunch one day at Vanto, with the weekend paper which I would read from cover to cover. But enough about exotic waiters, what's that adult sized puff ball doing in a swanky CBD changeroom? 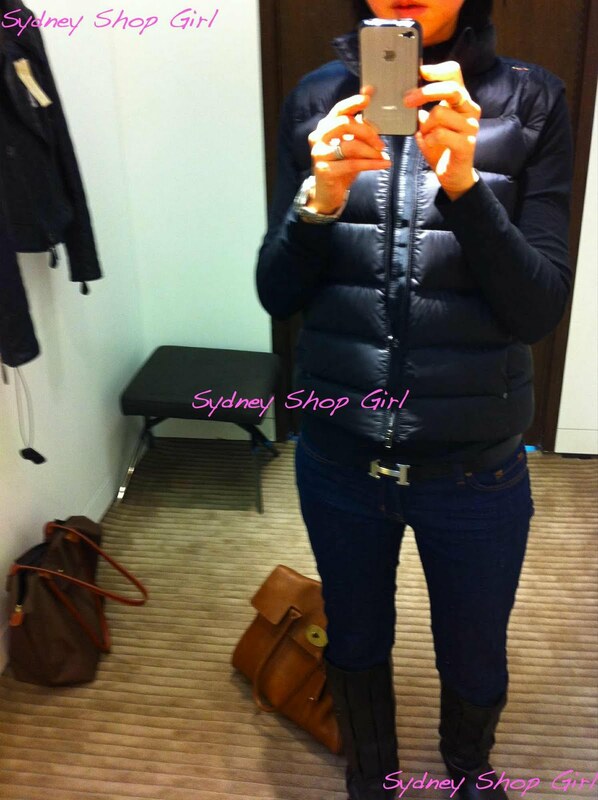 Puffer vest - Ralph Lauren from massive outlet haul in Hawaii, skivvy - Target (they wash well so get 'em while you can), belt - Hermes, skinnies - J Brand, boots - Bally, bag - Mulberry. I'm a puff ball on account of the weather and I'm there because it's Winter Sale Time. The sales have started early in Australia this year. 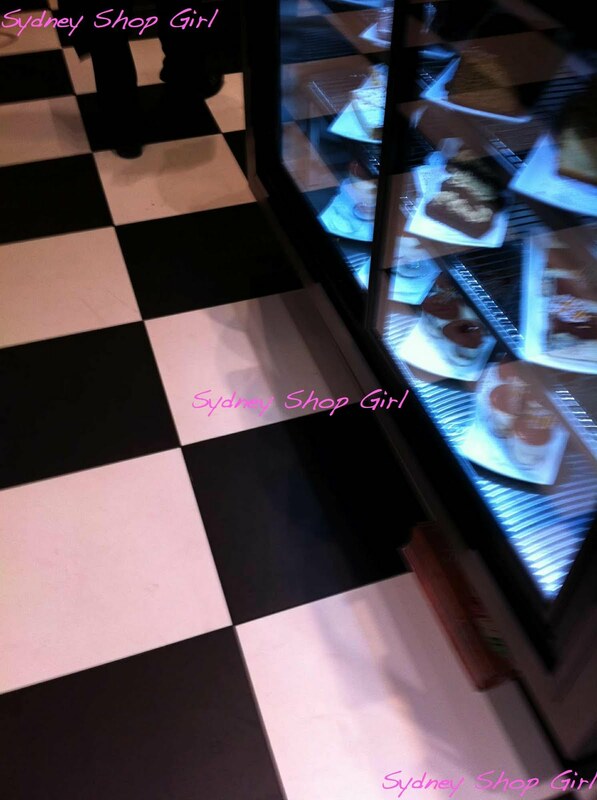 The challenging retail conditions in Australia are having dire consequences on my credit card. If you have a chance, do pop into the new Burberry flagship store on George Street. The changerooms are spacious, the staff are friendly and there is an incredibly cute childrenswear corner featuring miniature trench coats and gumboots. There's also a serious sale going on. You have been warned. It's winter, so it wasn't all glamour in the city. 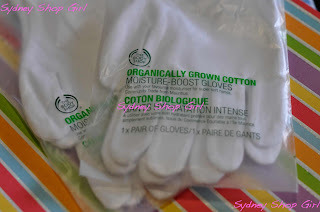 My hands get pretty badly chapped in the cold weather so I got these cotton gloves to wear over the hand cream and vaseline I slather them with each night. The gloves are from The Body Shop. They have a solid wrist band so I hope this means they won't wander off into the bed sheets overnight. Cool stuff from Typo at Rhodes. They've just opened there and the sales staff tell me business is out of control. I've spent the afternoon doing a bit of art and craft. You know how I spent last weekend organizing my wardrobe? I'm still having flashbacks. I'm so glad I did it though. You cannot imagine how pleasant it has been this week being able to locate what I need quickly and without any dramas or physical injuries. Anyway, the sorting is done but I needed a system to make sure everything stays where it's meant to. Many of my clothes are stowed away in boxes so I needed a labelling system for them. Except my handwriting and printing are both hideous. My wardrobe looks as if it should belong to a young child learning to read. Perhaps I could moonlight as a pre school teacher? Enter the cut and paste labels. I spent a couple of contented hours at my desk this afternoon cutting out clothing pictures from Lucky magazine (the US version of 'Shop 'Til You Drop'). Conveniently, it was the packing for your summer holiday issue so there was an abundance of suitable images. The tank top and singlet box. My work for the day is done. I'm just waiting for a boring lull in the sport so that I can hijack the remote and watch some real television. I've recorded the repeat telecast of episode 1 of Downton Abbey, I hope. I've heard good things about this. I love those tags SSG!!! 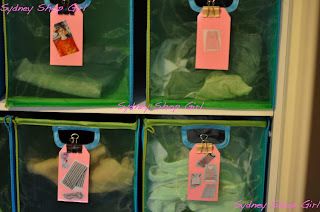 That pink tags are so cute, I should do that with my shoe boxes! M: thank you. The cut and paste session was very relaxing. 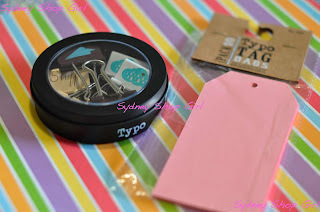 Tiffany: the tags would look great on shoe boxes, or polaroids of your shoes as tags? Very fashionista / stylist, I hear. Downton Abbey is the Shizz. It's fantastic. Love the clothes, love the jewels, love EVERYTHING. And it just gets better and better. You will love it. I never make it into town on the weekends. The furthest we seem to get is Chatswood for dumplings. Which is not a bad effort really. But I'll make an effort to look at the light installations when I am in town this week. Puffer vests are great. I find that they're rather polarizing. Lots of my friends consider them with askance because of the lack of sleeves, but that never has been an issue with me.